Global temperatures would still rise to 2.7 to 3.5 C above the pre-industrial level. The road to hell, it’s said, is paved with good intentions. 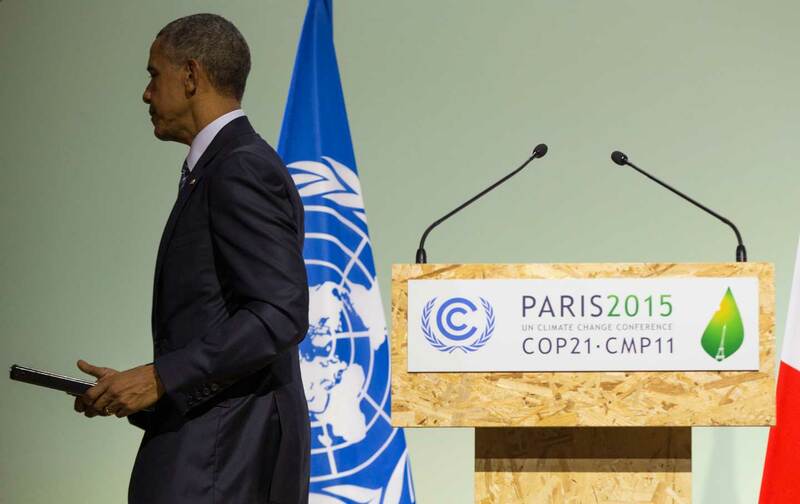 A case in point is unfolding at the landmark United Nations climate summit in Paris, where president Obama and other world leaders seem eager to define a scientific failure as a political success. This triumph of political spin over scientific reality is unfolding for understandable, even well-intentioned reasons, but its effects would be ruinous for human lives and institutions now and for generations to come. This lofty rhetoric, however, clashes with the actual proposals the United States, China, and other big powers are putting forward at the summit. As Obama noted, more than 180 countries have outlined pledges for future reductions in heat-trapping emissions of carbon dioxide and other greenhouse gases. But the combined effect of these voluntary pledges—even assuming, generously, that each is fully implemented—would still result in global emissions continuing to increase for decades to come, soaring well past the goal of limiting temperature rise to 2 degrees Celsius above the level that prevailed prior to the Industrial Revolution. Temperatures would instead rise to 2.7 to 3.5 C above the pre-industrial level, a catastrophic amount. How catastrophic? Bear in mind, 2 degrees is often described as a “safe” guardrail, but the latest science and real-world observations demonstrate that in fact it marks the threshold between “dangerous” and “extremely dangerous” warming. Just ask the leaders of Kiribati and other low-lying Pacific island states who are already planning the evacuation of homelands doomed to disappear within decades beneath rising seas. Or ask farmers in the Sahel region of Africa and other areas that already endure hot and dry conditions. Man-made warming has already increased temperatures by 1 degree C above pre-industrial levels, worsening droughts, heat waves, and storms, with predictable impacts on crop yields, rural incomes, and hunger in much of Africa and other poor regions. Thus the majority of the world’s governments urge a temperature limit of 1.5 C. This view is virtually absent from the US media, perhaps because these governments represent the world’s most vulnerable nations and the US government dismisses the position as unrealistic, but the disagreement is likely to permeate the rest of the Paris summit. The poor are by no means the only ones who would suffer if the pledges on the table in Paris are enshrined in an eventual agreement. In that case, the world would risk “crossing into [a] zone of irreversibility,” warns “Thresholds and Closing Windows,” a new report by scientists with the International Cryosphere Climate Initiative. “Reacting with ‘too little, too late’ may lock in the gradual but unavoidable transformation of our Earth…in a terrible legacy that may last a thousand years or more.” Sea levels would rise by at least 13 to 39 feet—enough to submerge much of New York, Washington, London, Tokyo, Shanghai, and countless other coastal cities around the world. This sea-level rise would not be fully felt for a century or three, but the process would be irreversible, dooming our descendants. “Despite good science, and good coverage from the media of this research, it really hasn’t gotten through to decision makers that these processes are so close, and so hard to stop once they begin,” said Pam Pearson, the initiative’s executive director. Instead, the spin coming out of Paris, not only from Obama but other world leaders, is that an agreement embracing the pledges made to date should count as success. Deftly lowering expectations, the big players behind the summit—the United States, the European Union, China, and other big emitters, as well as the summit’s leadership in the person of Christiana Figueres, the UN’s top climate official—have been saying for months that any agreement in Paris cannot achieve the 2 degrees limit. Figueres has joked that she will “cut off the head” of any journalist in Paris who claims a scoop for reporting that the summit will not achieve 2C, the goal the world’s governments agreed to in 2010. The trouble is, this “glass half full” outlook makes a certain amount of sense, if viewed from the perspective of human nature. Largely as a result of Figueres’s tireless diplomacy, more national governments than ever before have put forward pledges of emissions reductions (known in UN lingo as Intended Nationally Determined Contributions). These pledges, though voluntary, do represent the largest emissions reductions ever offered. All this indisputably amounts to remarkable political progress. And in the world of international diplomacy, taking two steps forward should be praised, the argument goes, if only to encourage participants to take more and bigger steps in the future. But the fact remains that this political progress would result in scientific disaster. This is no knock on Figueres, who has worked miracles and is not responsible for the pledges individual governments make. If anywhere, the fault lies with climate deniers in the fossil-fuel industry and US Congress and with all the other forces that blocked the world from taking stronger action years ago, before we found ourselves in our current predicament. Indeed, much of the reason the US pledge is relatively weak—it will cut emissions by 26 to 28 percent from 2005 levels by 2025, Obama reiterated in Paris—is that Republicans both in Congress and on the presidential campaign trail have declared all-out war on Obama’s climate policies and promise to undo them if they gain the White House in 2016. Still, the rest of the world must be clear about the implications of the agreement shaping up in Paris. Calling 2.7 to 3.5 C of warming a success is akin to saying, when leaping a canyon 15 feet wide, that leaping only 10 feet is no cause for alarm. After all, 10 feet is farther than you’ve leaped in the past and represents undeniable progress towards the ultimate goal. In fairness, the glass-half-full camp has an answer to this dilemma. They argue that any agreement in Paris must include a mechanism to ratchet up ambition over time: Governments should meet at five-year intervals to review progress and increase reductions as necessary to reach 2 C.
Nor is it too late to pursue a safer course. Detailed studies by the Potsdam Institute on Climate Impacts, perhaps the world’s leading climate-science center, demonstrate that the world could still achieve the 2 C goal, and perhaps even 1.5 C, through a more rapid transition to solar, wind, efficiency, and other low-carbon energy sources. This would require, however, dramatically different political choices than Obama and other world leaders in Paris appear to be contemplating. So what’s a climate activist to do? Civil society groups could both honor the undeniable progress the world’s governments have made yet stand firm for a science-based agreement by following the example of the European peace movement in the 1980s. After years of marches and other grassroots pressure, leaders in the US and the Soviet Union in 1985 finally made their first, incremental steps towards limiting nuclear weapons arsenals that threatened the end of civilization. Peace movement leaders responded by praising these initial steps even as they insisted that much more was needed: “Bravo—now, keep going!” said Mary Kaldor of the Committee for Nuclear Disarmament in Britain. The underlying conflict here—between what science requires and what politics offers—is one of the most vexing in the history of climate negotiations (and this reporter has been covering them since 1992). It’s understandable that leaders want to be cheerleaders who encourage future progress by celebrating initial steps; there can be wisdom in not letting the perfect be the enemy of the good. But a stubborn fact trumps such rationalizations: Science does not care about humans’ emotions or political conundrums. The laws of physics and chemistry do not compromise; they don’t know how. We must either find a way to respect these laws or, our good intentions notwithstanding, we will find ourselves on a road to hell.